TopRated MTBR.com Raves 5 out of 5! MTBR.com Raves 5 Out Of 5! "...dialed...no shortcuts on this bike..."
"Ticks all the right boxes"
The Deal: available now for limited time. For selection, SEE PULL DOWN MENUS Order now- sizes will sell out quickly +Prices may rise $200+ when sales goals are met. Warning: Order now to lock in the current sale price and selection. The price may be higher later. Warning: Sizes will sell out very quickly Buy now for the best price and selection. For example a Friday order will get an email on Monday. Weekends/Holidays are not counted as "days". 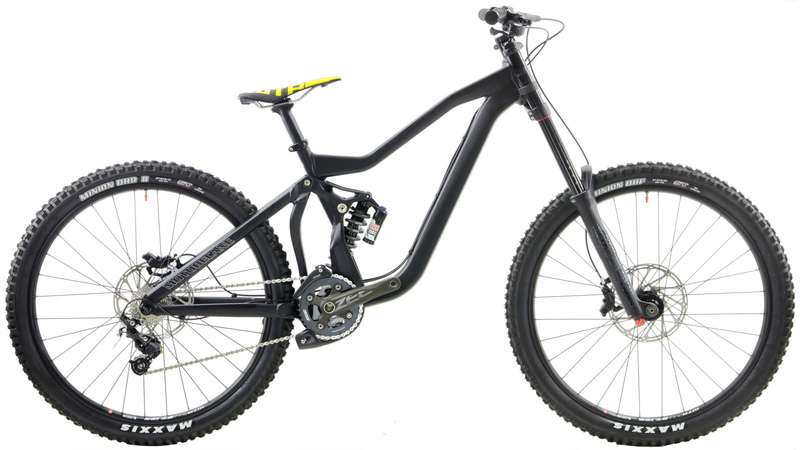 We have sold thousands of Motobecane Full Suspension mountain bikes. A high level of engineering and attention to detail is seen on all Motobecane mountain bikes. Happy customers send friends and family to buy these incredibly capable mountain bikes all the time. The 2Hundred Series is the much anticipated DH Downhill bicycle by Motobecane USA. Building upon over a decade of FS design and using world dominating Rockshox Suspension components, this Down Hill Full Suspension is designed for up to 200mm of terrain taming travel both front and rear. The suspension Linkage uses a Neutral Link concentric lower BB pivot for even more supple suspension tracking and incredible control even while applying the brakes. Wheelbase and head angles are optimized for incredible descending and control. MTBR.com editor rides a Motobecane DH Bike and raves: "...Frame angles are dialed...Held up in big descents...Great value...Drivetrain is dialed...there simply are no shortcuts in the spec...."
"...took this bike to a few local trails that get the blood flowing…bike was so calm…front and rear suspension working in concert with each other...long waterfall rock garden section could be taken at slow, medium, or high speed with a multitude of option lines….was quiet and controlled. Brakes were a delight, as they were powerful and easy to modulate. As the trail got loose the bike had good grip…very balanced on jumps and steep descents…" "
…this $2600 bike delivered.…especially attractive if there’s a bike park or convenient shuttle runs close by…such a good value…" "
about $2500 less than similarly equipped big brand downhill bikes" "
Drivetrain is dialed...there simply are no shortcuts in the spec. The tires are best of breed, and the bar/stem combo is spot on. Even the chain and the rims check out to be solid parts..."
PinkBike.com "The bigger story is the 'Neutral Link' rear suspension. The dual-link suspension's lower link pivots concentrically with the bottom bracket. The link, which houses the bottom bracket assembly has a knuckle machined into it that forms the lower shock mount. The upper link compresses the shock from the top, while the lower link participates by compressing the shock from the bottom. We surmise that the two actions are tuned to control the suspension's leverage rate as the wheel moves through its travel. The concept of compressing the damper from either end is shared by a handful of DH designs - Trek and Commencal come to mind..."
MTBR.com editor rides a 6by6 and raves: "...Frame angles are dialed...Held up in big descents...Great value..."
"...we’re happy to report that the bike checked out just fine…suspension is active vertically and stiff laterally…responsive…held up in the big descents without complaint….angles were just right at 67.5 and 73.5 respectively. For all-around trail riding, it definitely did the job. And at that price you’ll likely have money left over for upgrades. Frame is stout and laterally stiff, Frame angles are dialed, wheels are strong…attractive lines on it with a top tube bend for improved clearance. Tubes are oversized and welds are beefy. Component choices are smart…great value bike on the new 27.5 wheel size….best deals and components to deliver a solid package…models shipping now have an updated rear shock called the Monarch R rear shock with Fast Black 7075 shaft and Rapid Recovery rebound damping…this rear shock has excellent, supple performance and has very good mid-stroke damping support. Bottom line it’s an attractive and affordable package that leaves plenty of budget for down-the-road upgrades. …exciting sibling model announced…Team Version with RockShox Pike RCT3 forks, and XTR / XT 1x11 Speed, Guide Brakes…is ridiculous value and it will be an awesome performer. Bicycling Magazine says the Fantom Team carves the trails and has "components normally found on bikes costing thousands more..."
AFT / MTBR.com "Just put 11 miles on the new bike! This thing is amazing!! Can't get enough of these shocks, that and the rear derailleur shifts so damn quick. Love it!" Daniel E. MTBR.com "Wow this bike is incredible…this is the best and probably most expensive bike I've ever ridden, but I couldn't have even imagined a bike feeling this great on a trail. Not sure on the weight, but it feels very light and quick (I'm tubeless, which may help) while still being stiff. The travel is a lot, but I was able to use what looked like 80-90% on my ride today while still feeling efficient on the flats and climbs, noting that I was playing around with the rear lockout…Everything about this bike is great, looks amazing, hell even the saddle is very comfortable. JR Glenni MTBR.com "…my Hal6 Expert climbs great. Down shifting is firm and quick even when shifting late or downshifting more mid climb, and I didn't really notice pedal bob on the climbs. The front did tend to lift up on me more than I was used to, but I'm coming from a hard tail 29'er that was more of an XC design with a longer wheelbase, so that's not surprising. I was still able to climb pretty quickly with it, and I don't think the light(er) front end will be an issue as I get more used to it." Jeff R MTBR.com "I am also coming from a hardtail 29er, but feel that my hal6 climbs just as good if not better on technical climbs. I'm not fighting for my back wheel to maintain traction and it soaks up the roots, rocks, and bumps… On Saturday, broke my strava record for a technical climb I do regularly on my hal6 without even trying…All in all, I'm very impressed with the overall performance of the bike…"
P / MTBR.com "...short little review after ~5 miles of techy singletrack with around 1,000ft of climb. First off, I'm coming from a 2013 Stumpjumper Elite FSR 29er and have the Hal6 PRO for comparison. Obviously, the suspension on the moto is a HUGE upgrade. My first time riding a Pike and I must say, I'm sold. I was actually pedaling thru a lot of the rougher sections instead of trying to pick a perfect line. Also found it much easier to throw the bike around and clear a lot of the super tech stuff. Definitely a noticeable difference in geometry as well. I felt like I was in a much better position when I was pointed downhill. One of my biggest gripes with the Stumpy was pedal clearance. You basically can't pedal thru a turn on the Stumpy without striking a pedal. Didn't have a single strike on the Moto today…All in all, couldn't be happier with how everything performed on my first ride. ...feels fantastic on the downhill/tech sections. CC H. MTBR.com "I did another really technical climb on my hal 6 pro...I made it way further than I ever have on any other bike. Its narrow, rocky, rooted, and steep and even I was amazed at what I made it through. Part of the advantage of this bike is the high pedal clearance. I could also feel the back just sticking down, never spun out once even when leaning forward. I attribute that to the suspension, and the nice tires. The feeling of the bike under me is light and stiff. I assume the hal5 will climb better than the hal 6 because of a steeper head angle, and less travel front and rear. I will be doing a direct comparison with my friends 2018 stumpjumper FSR comp. the frame angles and measurements are almost identical on paper except for the seat tube on the Hal being steeper by 1.5 degrees…"
Even when reviewed at list price, magazines feel the Motobecane mountain bikes are incredible values. When you consider the discount BIKESDIRECT offers on these incredible quality mountain bikes; nothing else comes even close! Buy one now at a discounted, factory direct price with shipping included to 48 states, NO TAX Collected 48 States. Imagine the trails you will dominate with massive traction DH Tires and a Rockshox Boxxer Team 200mm up front with up to 200mm of Rockshox Coil travel in the rear. DH Bikes with similar specs sell for around $6,000 and up. No corners are cut, the Motobecane 2Hundred Series DH Bikes have Winning Technology. The 2018 Rockshox Boxxer Team forks MSRP up to $1300+ and rated as one of the best, if not THE Best long travel DH 200mm fork Period! Get Tubeless tech rims now. Tubeless wheelsets of this caliber sold by themselves are normally around $500. So this is an incredible deal: You are getting a complete Shimano mountain bike with a pro-quality TCS Rim wheelset. Get amazing technology, now! WTB Says:"Say goodbye to air compressors, tire levers and pinch flats. Say hello to your full riding potential." easy to install, fun to ride and simple to service..."
The drive train is race proven. Sealed bearing headset, proven Sealed Bottom brackets. Advanced Race Proven drivetrain with DH rear derailleurs and incredible SRAM CODE Four Piston Hydraulic brakes and levers. Motobecane USA has dialed in a race-proven geometry into this phenomenal ride. Very responsive and yet stable. Just like the award winning Motobecane hardtails and full suspension bikes, singletrack and switchbacks are all handled with ease. Slow speed, high speed, technical to flat-out hammering, you'll rip the trails 'cause this bike is so darn capable and super plush. S - 5'2" - 5'6"
M - 5'7" - 5"11"
L - 6' - 6'4"
This is a general guide, Sizing is a personal preference, the final choice is up to you. Between sizes? If you size up, you may touch when you straddle the bike.